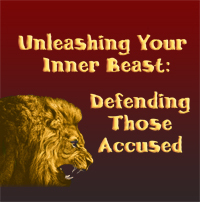 This series is all about Unleashing Your Inner Beast allowing you to honorably, aggressively, and ethically defend your client. We all know, and the statistics prove, that too many citizens are falsely accused, over-charged, or mercilessly punished. The Beast series is about tenaciously fighting to successfully and ethically defend your client while being fully prepared and primed with the law. You will receive an abundance of tools and insight from the excellent presenters, so you can vigorously and ethically defend your client with a fury that will not be forgotten.